Rugby is a game of long traditions, which have been developed over time into a number of values that guide the way the game is played and how players, coaches, officials and supporters conduct themselves. At its core, rugby is a physical game and a fundamental value is one of respect – for opponents, team-mates and officials. Rugby for the vast majority remains a sport played for enjoyment. 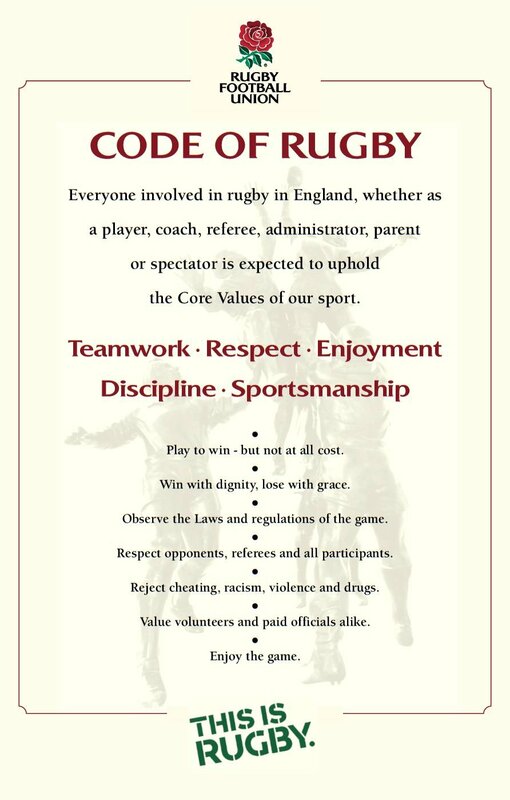 Because of this, the other core values that Bridgwater & Albion Youth Section aspire to are both firm and inclusive of all rugby activities. You will find those values embedded in the codes of conduct below. • Remember skill development, fun and enjoyment are the most important parts of the game. • Be attentive at all training/coaching sessions. • Work equally hard for yourself and your team and both will then benefit. • Play to the laws of the game and accept, without question, all the referee’s decisions. • Control your emotions. Verbal or physical abuse of team-mates, opponents, or match officials IS NOT ACCEPTABLE. • Treat all players, as you would like to be treated. Do not interfere with, bully or take unfair advantage of any player. • Recognise and appreciate the efforts made by coaches, parents, match officials and administrators in providing them with the opportunity to ply the game and enjoy the rugby environment. • Understand the values of loyalty and commitment to adults and team-mates. • Recognise that every young player has a right to expect their involvements in rugby to be safe and free from all types of abuse. • Understand that if an individual or group of young players feel that they are not being treated in a acceptable manner, then they have a right to tell an adult at the rugby club or outside of the game. • Never question an official’s judgement or honesty. In Rugby Union, coaches and administrators both fully acknowledge that parents are an integral part of the partnership, which ensures that young players enjoy their involvement in the sport and experience an environment in which they can flourish. • Remember that young people play rugby for their own enjoyment not that of their parents’. • Focus your child on practicing their skills, effort, sportsmanship and being part of a team. Winning isn’t everything and not everyone can score the winning try. • Be realistic about the young players’ ability; do not push them towards a level that they are not capable of achieving. • Provide positive verbal feedback both in training and during the game. Support and encourage your child – never criticize them for making mistakes. Console them for losing, but encourage them to try harder next time. • Remember that persistent, negative messages will adversely affect the players’ and referee’s performance and attitude. • Always support the rugby club in their efforts to eradicate loud, coarse and abusive behaviour from the game. • Support your coaches – they are giving up their time to train your child. If you have any issues with the way a coach is performing, talk to them first. Refer any issues to an Officer of the Club. • Remember young people learn much by example. • Always show appreciation of good play by ALL young players both from your own club and the opposition. • Be familiar with the coaching and training programme in order that they can ensure that their child is fully involved and the coaches are aware of their availability. • Be familiar with the teaching and coaching methods used by observing the session in which your child participates. • Be aware that the club has a duty of care and therefore, where appropriate, assist coaches with the supervision of the young players, particularly where numbers are large and there is a need to transport youngsters to away games. • Be involved with club activities and share your expertise. • Share concerns, if you have them, with club officials. Young rugby players are impressionable and their behaviour will often reflect that of the adults around them. In Rugby Union we welcome spectators on our touchline who embrace the ethos of the game as one of fun, enjoyment and skill development. • Remember children play for sport for their enjoyment not yours. • Acknowledge good individual skill and team performance from ALL youngsters irrespective of which team they play for. • Respect match official’s decisions. REMEMBER, they are volunteers providing an opportunity for youngsters to play Rugby. • Never verbally abuse young players, match officials, fellow spectators or coaches. Such behaviour can create a negative environment for young players and their behaviour will often reflect this. • Verbally encourage all youngsters in a positive way. If you do want to shout make sure it is ‘for’ not ‘at’ the players. • Encourage all youngsters irrespective of their ability – never ridicule any individual player, regardless of the team they play for. • Act as positive role models to all young players. • Be familiar with, and abide by, our Child Protection Guidance in relation to verbal and emotional abuse. • Respect the rugby club policy with regard to spectator behaviour.